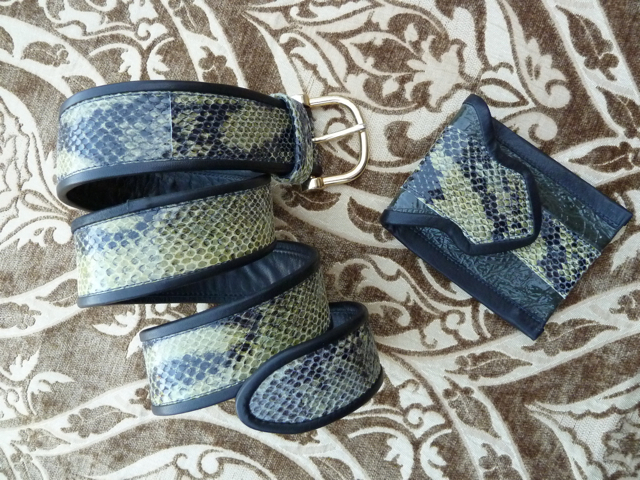 This snakeskin Print Leather belt in a multi-green, has a rolled-edge in black, comprised of three layers of leather, this belt is sturdy but soft. A gold colored metal buckle is somewhat equestrian styled, the size is 35-38" and can be shortened. The small leather cell phone case or credit/business card holder in the same combinations of leather has a velcrow closing for easy access. There is also a loop on the back which would allow you to wear it on the belt. This listing is for both items but they can also be purchased separately. They are Available Now, Off-Rack for the sale price, or can be Custom Ordered in other leathers, colors and textures at regular price.